Navigating Downtown can be a nightmare, especially when you're not feeling well. That's why Dr. Farzam of House Call Doctor Los Angeles is proud to provide the urgent care Downtown LA residents and even visitors want but didn't know they could have. That's because home visit doctors like Dr. Farzam aren't just a relic of the past, they still exist today and are effective in treating any variety of health predicaments. Dr. Farzam treats traumatic injuries, acute/chronic illnesses and almost anything that doesn't necessitate an emergency call to 911. For the past ten years, board-certified internist Dr. Farzam has served that Greater Los Angeles community by providing urgent care in Downtown LA and beyond. Because Dr. Farzam limits his practice to the LA area, he can make it to most any destination in an hour or less, even on weekends or holidays. Once patients make the call requesting urgent care in Downtown LA, the doctor is dispatched shortly thereafter, and the typical appointment time is 45 minutes. What's more, Dr. Farzam will personally follow up with his patients the day after. After calling Dr. Farzam for urgent care, Downtown LA residents can enjoy his services and professionals as long as they so choose. 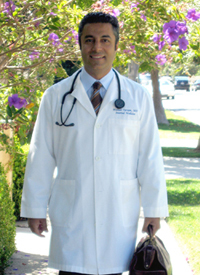 Dr. Farzam provides the 24 hour urgent care and physician access that is truly revolutionary. Whether you're in Downtown LA or anywhere in Los Angeles County, you can contact House Call Doctor Los Angeles by calling 310-849-7991 for further information and fee schedules. You can expect one-of-a-kind service once you make your first appointment!